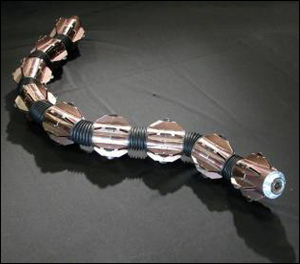 ACM-R5, one of the snake-inspired robots included in the survey (photo courtesy of Shigeo Hirose, Hirose-Fukushima Robotics Lab). An article written by Professor S.K. Gupta (ME/ISR) and his Ph.D. students James K. Hopkins and Brent W. Spranklin has been selected to be part of the journal Bioinspiration & Biomimetics’ “Highlights of 2009” collection. “A survey of snake-inspired robot designs” reports different types of snake-inspired robot designs and categorizes them based on their main characteristics. For each category, the authors discuss their relative advantages and disadvantages. The review assists in familiarizing a newcomer to the field with the existing designs and their distinguishing features. By studying existing successful robots, future designers will be able to create new designs by adopting their features. The review also summarizes the design challenges associated with the further advancement of the field and deploying snake-inspired robots in practice. “Highlights of 2009” is a special collection of papers that represent the breadth and excellence of the work published in the journal in 2009. The articles were selected for their presentation of outstanding new research, receipt of the highest praise from the international referees and the highest number of downloads in 2009. The articles in the collection are free to read until December 31, 2010.